There is no more prominent landmark in Russia than St. Basil's on Red Square. Each year tens of thousands of visitors walk past it, and many of them go inside to explore the labyrinth of chapels and narrow corridors. (The most frequently asked question: "Where is the exit?") Yet much in the history of St. Basil's also awaits discovery. Despite its fame, this astounding structure poses riddles that continue to baffle specialists. Even its name varies: the proper designation is the Cathedral of the Intercession on the Moat. The significance of the temple that epitomizes the extravagance of Muscovite imagination rests on more than its colorful exterior. Its origins are swathed in legend, most of them related to the notorious character of Ivan IV (the Terrible), who commissioned the Intercession Cathedral in 1555 as a commemoration of his taking of the Tatar capital of Kazan in 1552. (No reliable evidence exists that the builders of the church were blinded by command of the tsar after its completion.) And there is the person of Basil the Blessed, an ascetic who lived on alms in the vicinity of Red Square and whose colorful character has assumed legendary status. The basic plan consists of a central tower surrounded on a common base by eight free-standing churches, each with its own entrance. This proliferation of forms--increased by 17th-century additions--is dominated by the "tent" of the central tower, and by the alternation of height in the eight surrounding churches: small on the diagonal and large at the compass points. The octagonal motif at the base of the plan is repeated in the drum and tent roof of the central tower, as well as in the four octagonal churches on the compass points. The remaining, smaller churches have a cuboid base (partially obscured by the 17th-century enclosure of the cathedral terrace), with a cupola and round drum raised on three tiers of decorative gables know as kokoshniki. When viewed from the west side, the cathedral and its flanking stairways to the entrance project an imposing design appropriate to the ceremonial functions that culminated on this side, facing one of the main entrances to the Kremlin (the Frolov--later Savior--Tower). The origins of the Intercession Cathedral are as complex as its form. Soon after his storm of the city of Kazan on October 1-2, 1552, Ivan commanded that a church dedicated to the Holy Trinity be erected on the square outside the Kremlin at the Frolov Gate. The brick Church of the Trinity, completed in 1553 and located on a moat in front of the Kremlin, immediately became a popular shrine with seven attached wooden chapels. There is no reliable evidence as to the appearance of this ensemble, and no reason to assume that its proliferation of chapels had a particular architectural plan that served as a prototype for the subsequent masterpiece. The accrual of chapels around a shrine was a frequent practice in medieval Russian architecture. Ivan intended to rebuild the church on a scale indicative of the importance of his defeat of Kazan, which not only eliminated a troublesome relic of Mongol power but also opened a vast area for colonization and trade. And with the conquest in 1554-1556 of the khanate of Astrakhan, at the mouth of the Volga on the Caspian Sea, one of the most important Eurasian trading arteries came into Muscovy. In addition, and more significant from the religious point of view, the subjugation of the eastern Islamic khanates signaled a triumph for Russian Orthodoxy at a time when the church still faced challenges to its wealth, its institutions, and to its most sacred doctrines from various heretical movements (hence the symbolic dedication of the original church to the Trinity). A new monument was, therefore, to express the triumph of Orthodoxy and of Muscovy, a dual purpose evident in the sponsoring of the Intercession Cathedral by both the Metropolitan Macarius and the tsar. Ivan the Terrible's victories were not simply the repulse of an enemy or an episode in interminable border warfare, but a defining event in the identity of a nation, endowed with a sense of destiny. To celebrate these ideas, each of the components of the Intercession Cathedral was endowed with iconographic and symbolic meanings. The main axis begins on its eastern end with what has been construed as the original church, dedicated to the Trinity. The Trinity Church can be seen as the holy of holies for the structure, not only because of its eastern position but also by virtue of its dedication to the trinitarian concept, which forms the basis of the numerological system of the cathedral. Each axis, each diagonal, each side has three towers, whose structure from the terrace level is divided into three parts. The distinctive onion domes appeared in a restoration of the cathedral in 1586 following damage during the catastrophic Moscow fire of 1583. The original cupolas were apparently lower in shape and made of iron sheets covered with monochromatic tin. At the center of the main axis is the towering church dedicated to the Intercession of the Virgin, one of the most revered of Russian church holidays, a celebration of the divine protection extended to Russia. The day of its observance, October 1, coincided with the start of the final storming of Kazan. Until the completion of the Bell Tower of Ivan the Great in 1600, the Intercession tower was the highest structure in Moscow--some 61 meters. The Intercession tower owes much to the octagonal design of the Kremlin bell tower and thus illustrates the fusion of Italian Renaissance and Muscovite design in this most Russian of monuments. The decoration of the soaring “tent” of the tower is a combination of glazed terracotta ornaments and gilded, twisted metallic strips ascending the eight ribs of the tower. The base of the “tent” tower forms an eight-pointed star arising from tiers of decorative gables (kokoshniki). This base originally served as a platform for eight small drums and cupolas that were removed as a crumbling hazard during the reign of Catherine the Great. The Intercession Church is the visual and symbolic culmination of the exterior of St. Basil’s. Its central tower has become an icon of Russia, a complement to the Kremlin as a statement of national identity. 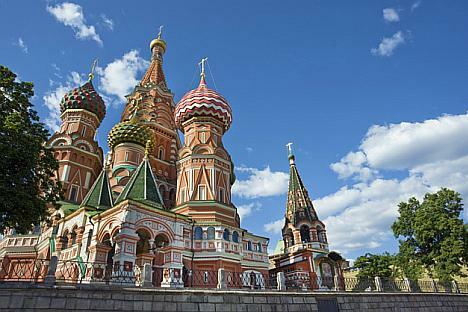 There are, however, other levels of meaning within the ensemble of towers known as St. Basil’s. The next article will explore the interior of this iconic shrine.